4/13/2009Share this story on Facebook! 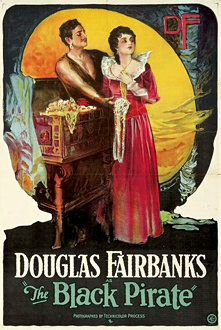 Poster for the silent film "The Black Pirate"
Ann Michel and Phil Wilde have been an integral part of FLEFF for several years. This year the Ithaca-based multimedia producers -- and real-life couple -- participated in a FLEFF lab based on their video project The Estrogen Connection, which seeks to educate students about cancer prevention. The couple also produced the screenings of three silent film classics, including Nosferatu (1922), The Black Pirate (1926), and The Wildcat (1921), at Cinemapolis in downtown Ithaca. The films were accompanied by live musical interpretations from area musicians. Watch Michel and Wilde's interview with FLEFF codirector and professor of politics Tom Shevory, and find out more about their experience at FLEFF. Video by Kyle Kelley '10.